This is a terrific game for preschoolers learning number recognition. In this number game, kids learn to identify numbers from 2 to 12. When children are working in small groups of four with their friends, learning becomes fun but is still challenging. Snowflake roll and cover challenge the children to correctly count the dice and cover the correct written number. 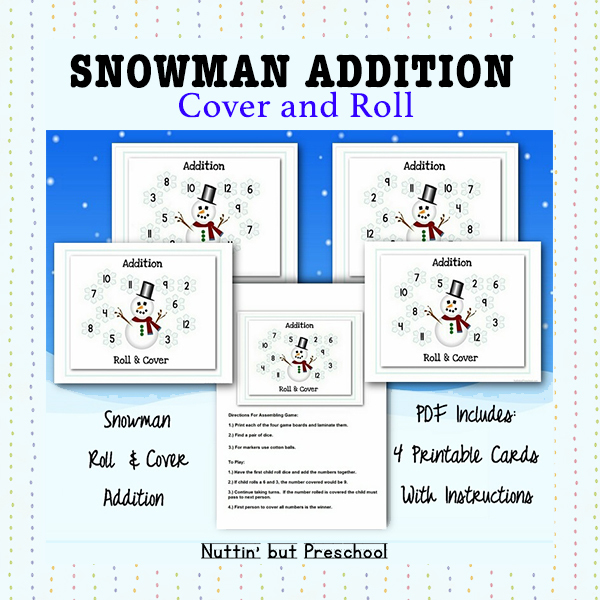 The PDF file containing 4 different roll and cover cards and directions is available for purchase for a small fee of $1.00. After you make your payment by Paypal you will be transferred to a secure link to download the pattern. 1.) Print all four of the game boards. 2.) Laminate all four game boards. 3.) Find a pair of dice. 4.) Use cotton balls as markers. 1.) Have the first child roll the dice and add the numbers (dots) together. 2.) If a child rolls a 6 and 3 the child would cover the nine. 3.) Continue taking turns. If the number rolled is already covered, they pass to the next person. 4.) The first person to cover all their numbers is the winner.